This week, while light on references to the DCU, finally marked the end of the Arrow resurrection mini-arc that followed the 'shocking' events of the midseason finale. 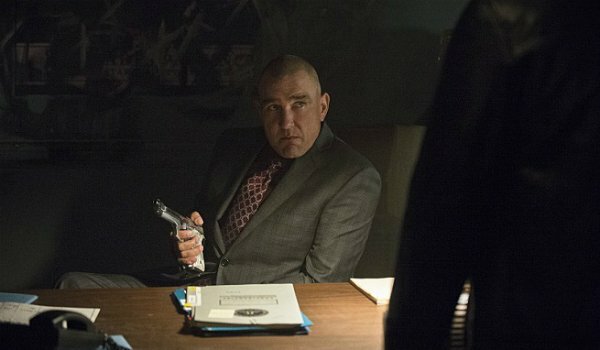 Since the superhero series' return, one adversary has been doing a lot of damage in Oliver's absence, with Vinnie Jones' villain setting up shop in "Left Behind" and then running the law out of the Glades in "Midnight City." It's going to take an old-fashioned “Uprising” to root out this miniboss. As Leslie Knope once said, "when the Ann's away, the mice get perms" and without the Green Arrow in Starling, Danny 'Brick' Brickwell has gone full curls. That's what a perm does, right? Anyway, Brick has used intimidation and the goons he 'sprung' from Iron Heights to takeover the Glades, and the remaining members of Team Arrow are struggling to handle the situation without Oliver. There was a nice nod to The Flash with one of the thugs asking Arsenal if he was the 'The Red Streak,' only to be told he had the wrong City. Even though Dig has way more field experience than Laurel, she's the one suiting up with Roy while he's running operations over Felicity's shoulder back at The Quiver. Lucky for them, Malcolm's been keeping tabs, even if they refuse to work with him. The best moment, though, came when Captain Lance called out Harper as being the Red Hood. Or when Ted Grant a.k.a. Wildcat threw down with Brick. How did he lose that fistfight? It was also a treat to have Sin back in the picture for the "Uprising," and it looks like she's the first one to have the heart to tell Quentin that the Black Canary leading the charge wasn't Sara. It was an interesting choice to have the flashbacks focus on Malcolm's past, considering nothing that they showed us 21 years ago was new information. Still, the trip to Nanda Parbat made sure they weren't a complete wash because we did get to see a young Nyssa al Ghul name Merlyn 'The Magician.' Oh, the flashbacks also included a young Tommy, but no one really cares about him or "The Undertaking" anymore. Nope, the Glades are in as bad a shape as they ever were and The League of Assassins are only concerned with getting vengeance for their Canary. Maybe Malcolm shouldn't have put the (now badass) daughter he proclaims to love so much in the crosshairs just to expunge his debt? Did he really think Oliver had a chance against Ra's al Ghul? I guess so, since they both seem intent on preparing him for a rematch. He better make sure to have Maseo and Tatsu Yamashiro close by in case he needs another 'resurrection.' His return to Starling City was a little flashy, using the zip-line and all, but I guess the city needed to know the Green Arrow was back in town. And I'm always happy to hear the superhero series name-drop Blüdhaven. 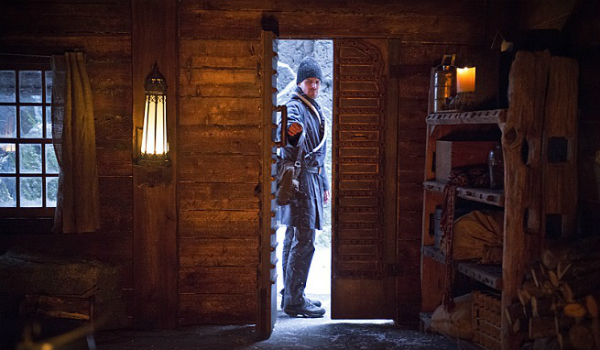 Arrow continues with Episode 13, “Canaries,” on Wednesday, February 11 at 8:00 p.m. ET on The CW. Created by Marc Guggenheim, Andrew Kreisberg and Greg Berlanti, the DC Comics inspired series stars Stephen Amell, Katie Cassidy, David Ramsey, Emily Bett Rickards, Willa Holland, Colton Haynes, Paul Blackthorne and John Barrowman.